A Russian Proton rocket shows signs of trouble before crashing after a failed launch from Baikonur Cosmodrome in Kazakhstan on July 2, 2013 (local time). Russia has temporarily suspended upcoming launches of its Proton-M rocket in the wake of Monday's high-profile mishap, according to media reports. An unmanned Proton-M crashed shortly after blasting off on Monday (July 1), destroying three navigation satellites worth a total of nearly $200 million. 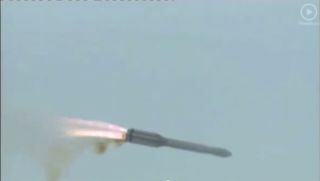 The incident marked the fifth major Proton launch failure since December 2010. The Proton-M crashed about 1.6 miles (2.5 kilometers) from its launch site, Baikonur Cosmodrome in the central Asian nation of Kazakhstan, gouging out a crater reported to be 660 feet (200 meters) wide. The rocket was carrying 600 tons of toxic heptyl, amyl and kerosene fuel. Rain has helped keep the burning fuel's poisonous smoke in check, but officials say this smoke could continue to drift, Ria Novosti reported. The town closest to the crash site is Baikonur, which lies about 38 miles (60 km) away. No injuries have been reported there or anywhere else as a result of the mishap. However, contamination will likely suspend activities at Baikonur Cosmodrome for two or three months, Ria Novosti reported, citing an unnamed source within the Russian space industry. The launch of a robotic Progress cargo ship to the International Space Station from Baikonur, currently scheduled for July 27, will probably be delayed as a result, according to this source. A Russian Proton rocket begins to lift off shortly before crashing after a failed launch from Baikonur Cosmodrome in Kazakhstan on July 2, 2013 (local time). The next manned launch from Baikonur is Soyuz 36, which is slated to blast off on Sept. 25 to take three new crewmembers to the International Space Station. The next Proton-M launch on the docket is currently set to take place July 20 and deliver the Astra 2E communications satellite to orbit. That mission will likely be significantly delayed while the Proton investigation is underway. The three satellites that crashed Monday were supposed to join the Glonass navigation system, Russia's homegrown alternative to the United States' Global Positioning System. Monday's mishap continues a string of recent problems for Glonass. Three other satellites bound for the constellation were lost after another Proton crash in December 2010, for example, and the Glonass network's chief designer was let go last year amid accusations of corruption. The Proton-M that went down yesterday was insured for 6 billion rubles ($182 million) with the Russian Insurance Center, Ria Novosti reported. Editor's note: A previous version of this story referred to the Glonass system as being in development. In actuality, Glonass has been operational since the 1990s.